As parents, most of us want our children to learn how to play a musical instrument. There’s an abundance of research that shows how valuable being involved in music can be for a child. But how do we help our children pick the right instrument? Pick it for them? Let them pick? We’ve found some great suggestions from expert musicians on what instrument a child should play based on their personality and physical characteristics. We hope these tips will help you and your child decide what instrument best suits them. Experts agree that the piano is a great starting instrument, providing a solid musical foundation. But if your child is extroverted and loves being around people, the piano may not appeal to them as it takes years of practice before they can play with others. 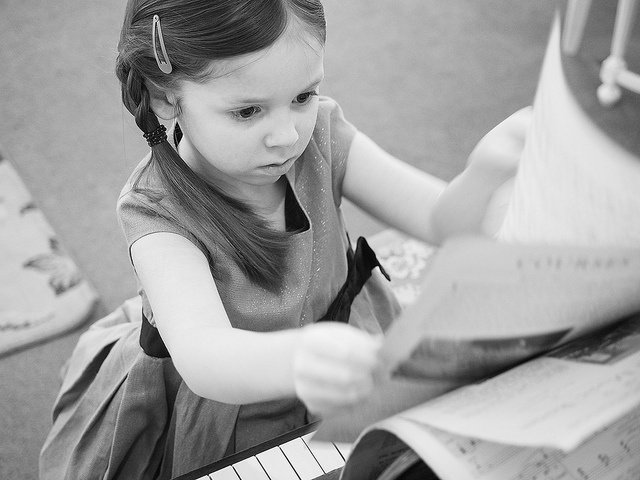 Generally, piano players are quiet, intelligent, inquisitive and analytical. It also helps if they have larger hands, longer fingers and great dexterity. 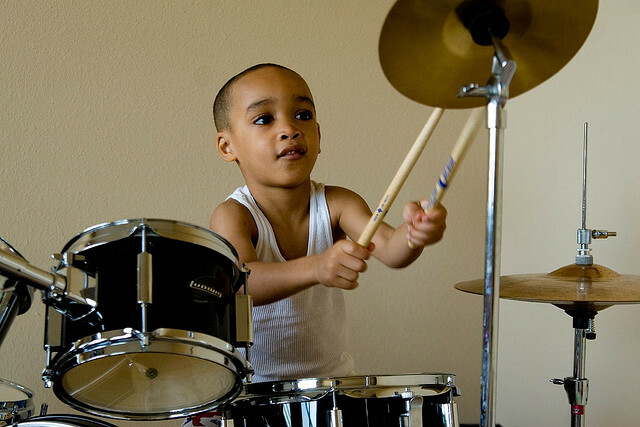 If your child tends to be a little restless, playing percussion could be the perfect fit for their nervous energy. This includes the drums, cymbals, maracas, wood-block, drum kit, xylophone and timpani. The trombone tends to be played by artistic, quietly sociable and sensitive children. It is an even more fun instrument to play if your child likes jazz music. The bassoon is said to fall into the hands of responsive, outgoing children, with a quiet sense of humor. You should also keep in mind that when assembled the bassoon is almost six-feet tall - maybe not the easiest option for a small child. The trumpet is widely known for drawing in more extroverted children. They can be bold, brash, have nervous energy and even tend to be dominant and ambitious. This is due to the nature of the trumpet, which is usually a lead instrument playing a higher melody. Other experts say that children with good hand-eye coordination will do well with the trumpet, adding that most trumpet players are also good at video games. According to some experts, above average intelligence is important in playing the very intricate oboe. Others say the oboe is ideal for determined, tight-lipped, stubborn introverts. While some music experts say the saxophone is better suited for extroverts, most agree that the saxophone is great for developing a personal style and for improvisation. If your child tends to personalize and make the music his/her own, the saxophone might be the right instrument for them. 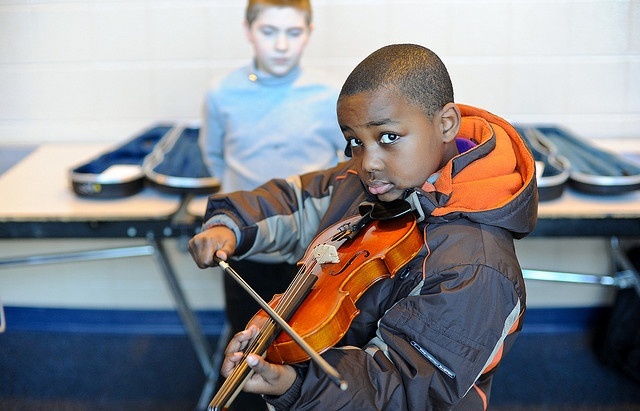 The violin is a great beginner instrument as it is offered in a variety of sizes. It is also good to start young as developing the type of flexibility needed to play can be awkward for someone who is older. Although it is a great starter instrument, keep in mind that experts say quietly behaved children who are happy to be a part of a whole, not needing to stand out and be heard, generally excel with a violin. If your child is bright, alert and sociable, suggest the clarinet. Experts also say clarinetists like working in groups and are born leaders. Experts are a bit divided when it comes to the personality type best suited for playing the flute. Some say that shy, lonely children who like privacy would enjoy playing the flute. While others say they tend to look for the talkative, smiley child who wants to be the center of attention. When considering physical characteristics for the flute, one expert mentioned looking for someone who used to be a swimmer and can take in a lot of air. Although we hope you will use these tips to help your child find the perfect instrument, remember that it is important for your child to be involved in choosing, as well. If your child already has an instrument they enjoy playing, don’t feel like you have to force them into playing one that fits their personality more. The important thing is that they are playing an instrument and enjoying it. If your child seems confused and doesn’t know which instrument to play, these tips would be great to steer them in the right direction! Also, check out this quiz to see what instrument might best fit their personality type: What musical instrument best fits your personality? Did you help your child choose the instrument they play now? What was the decision process like? Share your experience in the comment section below.